The Good Shepherd Catholic Parish Finance Committee consists of a number of parishioners with professional and financial backgrounds. The Finance/Administration Commission is a Commission of the Parish Pastoral Council in accordance with Canon 537. Its primary function is to assist the Pastor in the preparation of the yearly budget for review and approval by the Parish Pastoral Council. This Commission is to sustain the mission and the ongoing development of the parish community by providing the necessary administrative and financial skills. Working closely with the Pastor, who is accountable for the administration of the parish, this Commission concerns itself with all parish resources, the Catholic Parishes Campaign, the annual parish budget, parish support, and the effective use and maintenance of parish facilities. The collaboration of this Commission with the Pastor, the parish staff, and the Parish Pastoral Council is intended to free the Pastor for his role of spiritual leadership. The Finance Council also helps our pastor ensure proper funding is budgeted each year to pay our Catholic High School Assessment. Since 1998, local Evansville parishes are assessed a specific amount per parish student each year who attends Reitz Memorial and Mater Dei High School. Distributions from the assessment are used to help support the mission, spiritual and academic life at Reitz Memorial and Mater Dei High School. Our support enables them to offer a high quality Catholic education through the support of our entire Evansville community. Tuition only covers 60% of the total operating costs of the schools. Paying our yearly assessment is just one example of how Good Shepherd Catholic Parish also participates in the Church's position on tithing. The key to understanding how God wants all parishioners to give to the Church is found in 1 Corinthians 16:2, "On the first day of the week [Sunday] each of you should set aside whatever he can afford," and in 2 Corinthians 9:5-8, "So I thought it necessary to encourage the brothers to go on ahead to you and arrange in advance for your promised gift [donation], so that in this way it might be ready as a bountiful gift and not as an exaction. Consider this: Whoever sows sparingly will also reap sparingly, and whoever sows bountifully will also reap bountifully. Each must do as already determined without sadness or compulsion, for God loves a cheerful giver. Moreover, God is able to make every grace abundant for you, so that in all things, always having all you need, you may have an abundance for every good work." Michael Schaefer, Jay Hargis, Ben Joergens. Day of St. Rose of Lima (August 23). We will keep Spirit of Hope as a parish fundraiser. Preschool and Pre-k positions this will feed into our Kindergarten program and ultimately fill the school. Leasing the modular classrooms and hiring more staff would come from the Preschool and Pre-K tuition. need to hire more staff. School council is in agreement that with the idea of adding classrooms. reasons—not one specific reason caused these students to leave. enrollment is going down all over the U.S. Discussion about increasing enrollment levels for the school. Projected School deficit of $718,000 is now $580,000. Does tuition have any impact on enrollment? expenses. How much do we subsidize the school? Is there a set %? resulted in continuing to keep separate since so many schools fees and tuition are structured this way. add new ideas to attract students and families. Ben added that many parents (mid to lower income) use their tax refund to pay for their child’s tuition. Do we want to give the families a discount if they pay up front? This idea was declined. Catholic rate would be $6,600. will look at the possibility of discounts for both MHS &amp; GS. Gertesin, Ron Pohl, Ben Joergens. over another bingo crew. Our attendance numbers have increased due the closing of St. Ben’s bingo. before we knew an actual number of students. *FOB system is the majority of the expense, we will be getting a grant to pay half of the expenses. *Air Conditioning repair for Church. “cry room” for the church. This wall is not a support wall, so this will make it easier to install windows. Maraki software for 3 years we paid all expense up front and will dispense expense for next two years. Also, RHMS funds collected to reimburse tuition payment to RHMS-this is for only one parishioner. Mass, Weddings, Baccalaureate Mass and we need to be aware of any other events happening. Finance closets, Youth ministry and some Fall Festival items. parishioners to listen to “Bible Study” classes and other talks that are in their program. the booth. Can we come up with something easy that people of any age could help with in the booth? Discussion was tabled until Fall Festival committee meets and discusses issues. Christie is one other school that has a tuition raffle such as the one proposed. – 6 school. Another issue is that Home Schooling is growing. We need to understand that education is ONE of the missions of the church, but not the only one. Bingo is a major fundraiser for Good Shepherd Parish. Good Shepherd tithes 10% of Bingo profits to other charities. Bingo is held on Tuesdays and Sundays in the parish hall. Parents of students attending school and many other parishioners volunteer to work on Bingo crews. Contact the parish office/477-5405 if you are interested in helping. This annual campaign is a means of providing financial support for various service programs offered by the Catholic Diocese of Evansville. The financial assessment is set by the diocese and any money collected above the assessed amount is returned to the parish. Endowments are a wonderful way to support our Good Shepherd Catholic Parish, School, or specific ministry forever. By Creating this Catholic Legacy, the donor has the opportunity to name the endowment in honor or in memory of a loved one. Donors may determine the primary purpose of the endowment for a minimum gift of $5,000. Anyone can add to an existing endowment at any time and in any amount. An endowment application is available on-line so that you may begin the process of Creating your Catholic Legacy. Your charitable gift through an endowment is truly perpetual and will help to secure the future of Good Shepherd Catholic Parish, School, or specific area within our parish and the Diocese of Evansville. 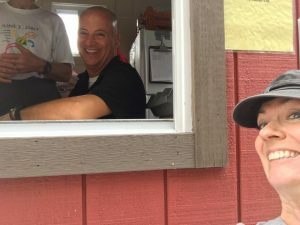 Before our official Parish merge, which became effective July 1, 2016, the Good Shepherd Catholic Parish's Fall Festival Booth was faithfully staffed by St. Theresa Catholic Parishioners for over 30 years. Booth proceeds for the 2016 Fall Festival Booth will be shared between Good Shepherd Catholic Parish and our Twinned Parish (St. Rose of Lima Parish in Pilate, Haiti). 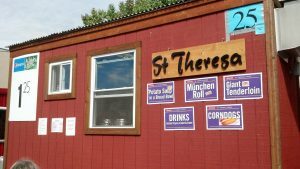 Brief Description of food items offered: Giant Tenderloin Sandwiches, Corn Dogs, Potato Soup in a Bread Bowl, Munchen Rolls (Bratwurst, sauerkraut and mozzarella cheese wrapped in pizza dough) and Drinks. Good Shepherd School Families may purchase scrip cards in the parish office or online and earn credit towards next year’s book fees! If you would like more information on how to use myscripwallet.com or shopwithscrip.com, contact Connie Sermersheim at 812-431-8053, or email her at kcsermie@gmail.com. We now have Azzip pizza and McAlister’s Scrip in stock! This is a major parish fundraiser that supports our operating budget. Our social is held the Thursday, Friday, and Saturday that include the fourth Saturday of June. 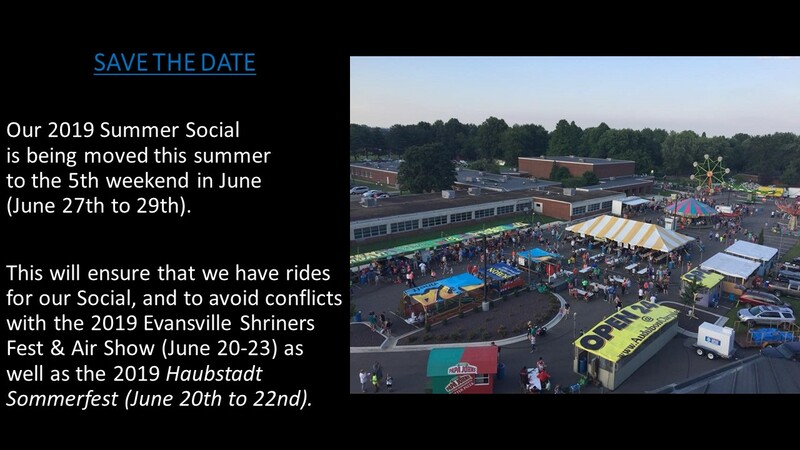 The summer social consists of food, game, auction, raffle and sales booths, carnival rides, dinners, and various other activities. A number of chairpersons oversee various operations of this event.